Jonathan Boakes / Scrapbook / Collected Oddments and rare items, films and art. About: Why a 'scrapbook'? Well, after years of collecting and storing various oddments on CD I was distressed to discover that many of the disks had degraded, and in some cases become 'unreadable'. So, a decision was made to collect as much old, odd and rare material together in one place. Here. The unofficial scrapbook of Jonathan Boakes. This web-page, long as it is, is mostly for my own usage. From time to time I need to access a rare file, or email an archived image to a friend, colleague or business associate. Creating an area for all these files has been a trip down memory lane, and I've discovered many strange and wonderful experiments. Feel free to browse through the items, but note that much of the material is protected by copyright (various). Please show respect. Published by The Adventure Company in the US, UK, France, Germany, Italy, Spain, Russia. Unseen imagery: Many of the images included in this section were unused, for various reasons. Of special interest are the images of the differing game boxes, and the Polly character portraits. Polly was only seen via a keyhole in Dark Fall 2. The character was downsized to keep the game content on one CD, following advice from publishers. Parker Portraits: Un-used in game, or promotions. Character tests. Polly Portraits: Fully formed/textured character for game, unseen and unused. Demarion Portraits: Un-used in game, or promotions. Character tests. High detail. Polly & Parker: Together at last!! Character portraits of both characters together. Unused. US Box packaging: Images of the US cardboard box packaging. EU DVD Boxes: A set of EU dvd box artwork, including translated subtitle. High resolution Press images: High quality images from Dark Fall 2: Lights Out. Mostly unseen. Technical tests & demos: Many experiments and demos were put together during the production of Dark Fall 2, from water animations to ghostly apparitions. The zip files, below, are some of these trials and troubles. 'Ghost effect 2' is a personal favourite. Water Effects: An experiment using DMTools 'DMWaves' effect for animation. Moving Fog: A real-time fog effect for Fetch Rock Island. Idea abandoned. Real-time Data Feedback: A random data feedback interface, possible ghosthunt gadget. Ghost effect 1: An unsuccessful attempt to create 'ghost FX' for Dark Fall 2. Ghost effect 2: Effective wraith-like aura, for use as 'ghost FX'. Effect & Scene unused. Ghost effect 3: An experiment with 'orbs' and 'trails' to create 'ghost fx'. Ghost effect 4: A further experiment with 'orbs' and 'trails' to create 'ghost fx'. Lighthouse Beams: A test to create live lighthouse beams. Abandoned for budget reasons. Dark Fall 2: A video of the title sequence, for use in composing music. Misc: Various odd 'bits and bobs' from the production and and post-production of Dark Fall 2. Tutorials for print magazine, rare press releases and in-house oddments. Dark Fall 2 videos: A collection of videos un-seen elsewhere. Mostly unused. Complete scripts: The complete unedited script, very different to final game script. Demarion unknown history. More info on the heavily trimmed character. Unseen character scripts: Unedited character scripts. Recorded but unused. A revealing newspaper article regarding Fetch Rock & Polly White. Unseen in game. Exhibition Centre Commentary: A public announcement voice for the exhibition. Dropped. Handy for cheaters!! : The complete list of game locations to insert into save games. Finding a secret ghost: Article for 'Ghost' magazine, US. Unused in magazine. With pics. Making Games: Article for DIGIT magazine, about making Indie games. Original form. Ultra-rare script: Malakai's all-important script. Concerns his voyage into the unknown. Vimal's personal log: Text for a D.E.O.S employees PDA unit. Unused. 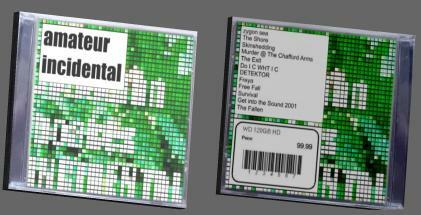 Dark Fall 2 Jewel Case: Image of smaller square box released by The Adventure Company. US only. Russian Jewel Case: Funky RUSSIAN version of the artwork. Very rare outside of Russia. Mobile Phone Captures: The author snapped with camera phones around UK. Very odd German re-release: Strange packaging. A legal re-release? 2001 - 2002: PC-CDROM Adventure Game. 2001: Published by Jonathan Boakes & XXv Productions. 2002: Published by The Adventure Company in the US, UK, France, Germany, Italy, Spain, Russia. Various oddments and rareties: Many experiments and demos were put together during the production of Dark Fall, from ghostly apparitions to foreign language demos. The zip files, below, are some of these trials and troubles. French Demo: Different artwork and documents to English version. US Store copies: 3 photos of the game in a US store. The Adventure Company: The publishers website goes 'Dark Fall' mad. Cut out and keep: The US box packaging ...exploded. Old website: A twee, and fondly remembered, version of the website. 3 images. Original DVD Indie Artwork: A zip containing the very file that I sent to the printers, in 2001. Packaging and boxes: Dark Fall's packaging underwent many, many changes. Below are a few of the examples. As well as the more common Adventure Company releases, there was the now ultra-rare 'disks of darkness', and dodgy Ebay pirate copies. Box Design 1: The very first cover design. My design, 2000 printed. Very Rare. Box Design 2: The Adventure Company's 2nd box design. Is it bird poo? Box Design 3: The Adventure Company's 3rd box design. Scooby-doo-tastic. Box Design 4: The Adventure Company's 4th box design. This was approved for development. Box Design 4b: The next stage of development, following Box Design 4. Box Design 5: Final US edition. Two sizes printed. See 'cut out and keep' above. Box Design 6: The Adventure Company's 6th box design. EU editions. Box Design 6 again: Italian version published by ATARI. Box Design 7: Jewel-case budget edition. Box Design 8: Jewel-case RUSSIAN edition. Funky artwork. Rare outside US. CD 1: 'Disks of Darkness' edition: Very rare. Less than 1000 copies. CD 2: Adventure Company edition: Slight regional variations, globally released. I was more than a little surprised, just recently, to find two gameplay movies online at Gamespot. They are available to view live via this link: Gamespot, or download the clips below. Thanks to whoever captured them, as they are really nice clips. Gameplay Movie 1: The voice of Timothy Pike guides you through the dark. Gameplay Movie 2: Footsteps can be heard in the hotel rooms, and corridors. Interactive experimental/abstract crime scene software. 2002 - Coursework for BA Hons in Digital Arts at Thames Valley University. About: A university brief was et to create an "interactive presentation with Macromedia's Director, with some exploration of a virtual or real-world space". Using video, sound and interactive 3D, Forensic is a disturbing exploration of a house, complete with murder victim. Explore the various rooms in search of clues, and evidence. Various oddments and behind the scenes assets: As well as the complete version of this project (a modest 50 megabytes), there's a few stills from the project. Screen grabs / stills: A selection of stills from the CDROM, click to view the images. Forensic: Finished interactive version, for all Windows versions. 2002 - Coursework for BA Hons in Digital Arts. About: ISO is a near abstract film exploring the experience of enrolling at University, and the foundations of voluntary learning . Themes such as loneliness, displacement and depression are explored through voice, music and film footage of the University. The film was a joint project between 4 students, with direction and soundtrack by Jonathan Boakes. The film was screened at the Ealing Film Studios as part of the University's end of year show. Assets: The complete film is available to download in Bink format. Un-zip the file and double click the 'exe' file. ISO: The complete film in BINK format. Will work on all Windows platforms. Music album / techno / trance / industrial / ambient. 2001 - 12 track music album for new restaurant chain, London. About: This collection of music was commissioned/produced for a chain of Japanese Restaurants across London. As well as performing the tracks live on the opening night (two CD decks, 8 track sampler, rebirth), the album was also recorded and played in the venues on a regular basis. Please note, the music does not suit all tastes, and was produced for a specific sound system. Don't have nightmares. Description: Musically, the sounds are most likened to the bands Broadcast, Autecre, Aphex Twin, Orbital, Pram and Black Box Recorder. Please note: The pressing, distribution and encoding to mp3 (many times over) has resulted in some 'distortion' on some tracks. Assets: The complete album is available to download, or select individual tracks to stream. Many of the tracks contain samples, so, tv and music fans may have fun spotting them. Incidental: The complete album (zip file, 87mbs). Zygon Sea: (contains sample from 'All in the Mind' Radio 4, Doctor Who:Terror of the Zygons). Skinshedding: (contains a sample from Why?Who?When? by Amateur). Murder @ The Chafford Arms: (contains a sample from Jonathan's old mobile phone ring tone!). The Exit: (contains a sample from Sapphire & Steel, Adventure 2). DO U C WHT I C: (vocal j.boakes). DETEKTOR: (vocal j.boakes & l.Marsh, sample from the Sierra Adventure 'Shivers 2'). Freya: (sample from Buffy Vampire Slayer (The Wish) & the Erasure track 'Perfect Stranger'). Survival: (sample from Doctor Who: Survival). Get into the sound 2001: (vocal k.williams, j.boakes, sample The Avengers theme). Short B/W film and interactive CDROM. 2000 - Final for B-Tec National Diploma in Digital Arts. About: Detektor is a short black and white film, in a neo-expressionist style, directed by Jonathan Boakes. An interactive version of the film was released on CDROM, and exhibited across London in 2000 and 2001. Following a brief to create an immersive and artistically challenging 'digital work'. The stark footage was filmed on location in Kent (outside Maidstone) and a run-down building in Fassett Square, in London's Eastend. The narrative, as it is, follows the thoughts of a lonely man as he listens to a mystery cassette tape. In the meantime, a boy searches for artifacts in a woodland, using his metal detector. Is there a connection between the two characters? Various oddments and behind the scenes assets: The conceptualisation process throws up all sorts of storyboards, oddments and pre-production assets. Some are listed below. Film Stills: A selection of stills from the film, click to view the image. Zipped Film Stills: Larger editions of the film stills in a zip file. Storyboard: This is not the best artwork! It's a little rough, but it got the job finished. Detektor Interactive: A selection of screens from the interactive version. Soundtrack Samples: Sections of the near-abstract Trip-Hop soundtrack. 1999-2000 - Final examination piece for a B-Tec National Diploma in Digital Arts. About: Cortexa is a piece of multimedia work presented on CD Rom. The work explores the different aspects and abilities of the brain. The users brain is scanned at the beginning of the presentation and then shown on screen, (fictional obviously). The user is then able to explore their own cortexes and neural pathways. Along the way the user has to solve or complete simple puzzles and activities. These tasks include sound, visual and memory puzzles appropriate to the current cortex. Their success (or failure) results in rises in brain activity. Cortexa was presented, by Jonathan Boakes, at the University of Astronomy in Poitier, France, on the 19th of March, 2000. This show was part of the RIHL Poitier Film Festival. The project was nominated second in the Multimedia Award. Assets: A mixed bunch for Cortexa, there's photos from the festival, Cortexa complete download, the 1999 Festival Poster and more. Cortexa: The complete project for all Windows platforms (zip file, 63mbs). Festival Photos: A selection of photos of directors, Poitier and..umm...drunken dancing. Festival Poster: The rather classy 2000 poster. The Films: Captured web material from the 2000 festival website. The Media: The listings for the 'Nouveaux Media' entries, including Cortexa. Videos: Filmed and edited during the festival, these films explore the event, the attendees, nightlife and soul of the film festival. Please note, this is specific material regarding the festival and could be described as 'dull'. Many scenes are presented in French only. Intro Video: Short introduction to the festival (DivX MPeg4, 3mbs). Videozine1: Short film regarding the festival, and attendees (DivX MPeg4, 34mbs). Videozine2: Festival footage (RIHL TV) and feature (DivX MPeg4, 54 mbs). Videozine3: Short film featuring footage of Poitier, festival and films (DivX MPeg4, 55 mbs). Videozine4: Incomplete film, with blank scenes. Sorry. (DivX MPeg4, 18mbs). Interactive CDROM, with poetry by Walter de la Mare. 2000 - Coursework piece for a B-Tec National Diploma in Digital Arts. Southwark College. About: The brief was to create a QTVR environment, of the designers choice. Personally, I found QTVR rather twee, even back in 2000. So, instead of a node based 'interactive room in my house', or a 'view of the street' (both of which were produced by other students) I opted for a more surreal, distorted view of near abstract material. My tutor, at the time, was a little furious, but he backed down eventually, and gave the project a cool A+. Not bad for a b/w QTVR about an old poem. Walter de la Mare's 'The Listeners' is a classic supernatural work, and beautifully written. It was a pleasure to work with the material, and feature the reading from the BBC's 'Favourite poems' collection. Assets: The full project is available to download, at a modest 32mgs. Un-zip the file and double click the "The_Listeners.exe" file. Once loaded, select a chapter using the drop-down, and explore the images for hidden sounds, by dragging the mouse with the left button held down. Have fun! The Listeners: The complete project for all Windows platforms (zip file, 32mbs). 30 second commercial, for use on television and inside the British Library. 1999 - Coursework piece for a B-Tec National Diploma in Digital Arts. Southwark College. About: Choosing from 4 possible companies, the aim was to create a lively, and artistically challenging commercial (advert) for use on television. Choosing The British Library, the commercial explores how text has helped form, and record, human civilisation through the passing eras, from illuminated manuscripts to digital fonts. Assets: The full commercial (advertisement) is available to download, and view. Also, from the same time, a short news clipping of the British Museum's Egyptian Exhibition is also offered. It features the primary school class of Philip Philippou, contributor to both Dark Fall games. The British Library: The complete commercial (zip file, 15mbs). The British Museum: A news clipping from the BBC (zip file, 15mbs). Collected below are many oddments, and rarities, stored here for the purposes of preservation, and archiving. Occasionally, I need to refer to these projects, even though some of them are decades old, and hopelessly 'out of date'. Fassett Square: Website devoted to area of London's Eastend (old home). Newspaper Cutting: "Millions could see spiritual home of top TV show's set". Blob 3:Possession: Summer'98 holiday project for nephew, & lots of fun to make! (37mgs, MOV). Portfolio: A portfolio presentation from 1999. Angel: Surreal short film from 1999 (75mgs, Bink). Concept Art: A zip containing digital sketches for an unmade game. 3D Coastline (game test): A few screens from a 3D game test, called "The Celtic Poet". Twice Told Tales of Lynch Fox Woods: Digital versions from a photographic exhibition from 1997. All individual works are protected by Copyright@1998-2006 and Intellectual Property Rights. Except when otherwise stated.